Construction begins in April. The whole structure will be precast concrete. The precasting of features may be done in a tented workshop behind Yangtze restaurant using handcarved wooden molds, then put on the concrete main frame. It will take two months to cast, then painting will take two months, altogether five to six months. There are a number of concerns regarding the use of residential land adjacent to houses on Cambridge for industrial uses that can be quite dusty and dirty. The site will be fenced during operations and the CBIA will clean up afterwards. Due to the street closure on Cambridge, access to the lot will have to be through the Yangtze parking lot. 1010 Somerset has a dome and is an industrial zoned property where they are repairing stones etc from the Parliamentary precinct, this might be a good alternative location for the precasting as it is nearby. Board members suggested a workshop or community consultation meeting as to use what methods or precasting will be used, where the water will come from, how industrial waste will be dealt with as the sewers are combined, dealing with sand blasting/air pollution control. The City and contractors are discussing the full closure or partial closure of Somerset for 2-3 months for safety reasons. It appears this is a city safety initiative. There was discussion of alternative routes, detours through the city parking lot, keeping one lane open at all times, etc. The lowest point of the arch will be 16’ above the street; the top point will be about 33’ above the street. The arch spanning the street will weigh 100 tons, when the decorative elements are added, 130 tons altogether. In preparation for the project, a gas main has to be moved; hydro lines on the south side must be relocated or buried. The photoshop arch picture is not totally correct, as the piers supporting the arch will be located on bulb outs that will replace 2 parking spaces. The arch will be completed for unveiling on October 13, the 40th anniversary of the modern Canada-China relationship so it is a tight deadline. Grace wants to share pictures of the process via websites, blogs, etc. DCA members agreed that the construction process should itself be a tourist attraction of considerable interest and well worth documenting. The CBIA has hired a lighting consultant. 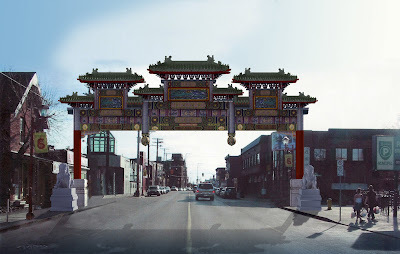 Current plans are to add floodlights to the existing Chinatown light fixtures and two more light poles using the existing design. There is also a move to upgrade the block from Cambridge to Bronson (perhaps as part of the Bronson reconstruction process) to the new Chinatown streetscaping design being developed this spring as part of the Somerset reconstruction process underway from Preston up to Booth. The CBIA is also heading up a search process for the teams of workers from China who will build the arch. They are looking for accommodation for 16 to 46 workers at a time. The PBIA is working on a marketing idea for closing Preston on cycling Sundays. The Preston street closure would connect the Ottawa River bikeways to the Rideau Canal paths. The PBIA is in logistics discussions with NCC and City. The idea is to make Preston street a useful link in the bike network, opening up new routing combinations, and making the street and its café’s a destination for cyclists. They are trying for July 2010 only as a trial. The street should be attractive to cyclists and roller bladders as it will be freshly repaved and very smooth. Questions were raised about the Sunday morning restaurant crowd -- would they park on residential streets? where would the Number 3 bus go? Diane Holmes said City engineers could make projections of various scenarios. If the whole street is closed, volunteers or paid staff would be needed for each cross street/intersection. For that reason, they are also examining a model whereby only one half of the street would be closed to cars, for example, the southbound land would become a bike zone and cars would use the street northbound to access restaurants and residential street. Members questioned whether the closure should extend north of Somerset (the predominantly residential area). There was also some discussion of using the Preston “extension” which leads out to a legal crosswalk over the transitway. This route is also of keen interest to Bluesfest. The PBIA is also working on a farmer's market concept. They have met with Ministry of Public Works regarding the giant warehouse that stretches from Gladstone to Somerset along the OTrain line. The market would be located at the Gladstone end of the property, where there is a surface parking lot between the building and the street (currently also used by Gladstone Theatre patrons in evenings). Previous government ideas of building office buildings there have been abandoned as the site isn’t of a large enough scale for large office complexes, and the policy now is to disperse government office buildings into large complexes in the suburbs (hopefully on the transitway!) and Gatineau . The feds are discussing disposing the building. As for the state of the building, no work has been done since the 60s except for emergency repairs. An environmental assessment of the building will take some time. Meanwhile, the PBIA will try a proof of concept outdoor market for this summer, according to a business plan currently under development. The Lansdowne farmers won't come if there are resellers. Resellers will seriously underprice the premium Lansdowne farmer group. There was some discussion as to which group, if either, might meet the needs of our neighbourhood income demographic. The Lansdowne farmers are too stretched, so can only commit to a weekday market, which would then move back to Lansdowne on weekends. The PBIA is looking at having a weekend fleamarket or antique market. The PBIA is also funding a market retail gap assessment to identify business opportunities that might diversify the Preston Street mix which is heavily weighted by restaurants. This might include an indoor four season food vendor, such as Produce Depot. The current church at the corner of LeBreton and Eccles was built in 1991. The church has acquired 2 lots on Bell, accessible from the rear of the church parking lot (the new property does not offer continuous street frontage, the two portions of the church property would be connected back to side). Maija and David attended a residents' meeting at the invitation of the Church. Concerns focused on the passenger drop off on Bell and safety issues for this very narrow street, the new structure’s very institutional frontage, and the undersupply of parking for the new building. As encourage by a prior DCA meeting with the church, they looked at having a housing component on the Bell Street side, but apparently found it too expensive. DCA members expressed concern about fragmentation of the residential area and the intrusion/expansion of institution uses at the expense of residential areas. The Church has offered to come and talk to the DCA Board. The Church hasn’t applied for zoning change, and the planning process seems to be going very slowly. DCA members expressed concern about the building size for the lot, lack of setbacks, and predicted a difficult approval process. The Board requested that David meet with the church to discuss options that would make the proposal more palatable to the community. Councillor Holmes suggested at last Somerset Reconstruction meeting that it was possible to delay construction for one year to permit further airing of views on what should be done. However, DCA members felt a lot of progress was being made, in part because the meeting cycle was now weekly rather than monthly, and progress was being made. Concern was also expressed that coming government austerity measures might delay or reduce the scope of the project, so we preferred the project go ahead in 2010 as planned, but not at the cost of getting a good plan acceptable to all stakeholders. Next stakeholder meeting is Feb 4th with twice weekly meetings until the end of Feb to keep the project on schedule for digging May 1st. David and Charles were to attend the first Bronson meeting; however it was cancelled/postponed due to controversy about the technical meetings already held without community involvement and without identifying community issues. The initial technical design apparently looked very suburban and auto-focused. The community design is to be more than decorative landscaping elements added to a street plan designed to move more rush hour commuters. David is to circulate our initial list of concerns to board members for comments. The reconstruction will be from Queen Street to the Queensway. There will be two phases: starting in 2011 Queen St to Somerset; 2012 Somerset to Qway. Concern was also expressed as to how the reconstruction will move forward the study considerations from the Escarpment Plan and how DOTT plans should be integrated. The DCA previously send the City a letter re an Arlington house demolition. Our comments were not included in the staff's recommendations to demolish, which makes us wonder why our input was asked for in the first place. Eric to resend comments to council. The city is considering several new water billing methods. Of particular concern, the fixed amount or base charge of the water bill is set to increase. This would not encourage conservation and will hit hardest on low-user households, some of which are low users because they are committed to conservation measures or are small households (elderly, single parents, single persons). A city report is to come out Feb4, Councilor Holmes will ensure we get a copy, but it goes to council just a week later, which makes understanding the complexities difficult. The board expressed an aversion to fixed cost component to water bills preferring a system that encourages conservation and keeps water affordable for lower income households. Charles to circulate the staff proposals, when released, for an e-mail consultation and response. The board heard pleasing news about the continued employment of the editor and the financial status of the paper. An Annual General Meeting is required by the DCA constitution. An AGM should be used as a means to draw out people to build up membership. Guest speaker is not required. Instead we could offer an update of development in the neighborhood, since there are so many plans underway. We settled on the proposed date of April 13. The March issue of the Buzz will have to carry the advert. Archie has been involved since last spring with a group called "Our Ottawa" which intends to endorse candidates in this fall's municipal elections. The group has written a policy document posted on the group's website which is in the process of being set up. Once this is done, he will circulate the "Our Ottawa" URL to the Board members. The PBIA is proposing a series of 14-25 high sculptures for this corner. The sketch shown is a preliminary concept only, not a final design. Concerns were expressed about the aesthetics, whose land it would be on, etc. The DCA will ask the PBIA for more info on this project. 201 Bell Street (large apt towers between Gladstone and the Qway) has been purchased by new owners who plan major renovatios, changing the exterior façade, installing new windows, etc. Rents will go up to cover the seven million dollar renovation cost. As a building with lots of students, immigrants, and lower income households, there is concern we may lose some of our lower cost housing supply. Wow, lots of exciting initiatives! I love the Sunday BikeWay, the market concept, sculptures and the arch, etc! I know that I would like to see the local, small scale farmers, but I suspect most of my neighbours would just like some nice, affordable, produce. Tough call. Roller bladders on Preston? Ah, the perils of spell check. Anyway, bring on the cheap vegetables. If the Lansdowne vendors are too sniffy to rub shoulders with resellers, then nuts to them. But, either way, groceries in the neigbourhood, and other possibilities like an antique market, space for community group,etc, is VERY exciting to me!